You do not know what to give? 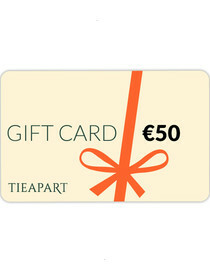 Choose a Tieapart Gift Card! Select the value of your gift and proceed with the purchase, as if it were a normal product for sale on Tieapart. You will receive an email with the card and the coupon code to send to whoever you want, by email or printed. Gift Cards does not expire. Available in the following values: €50, €75, €100, €125, €150, €200. Please note that this item is not eligible for return. Promotions can not be applied to this product. Please contact us for further information.